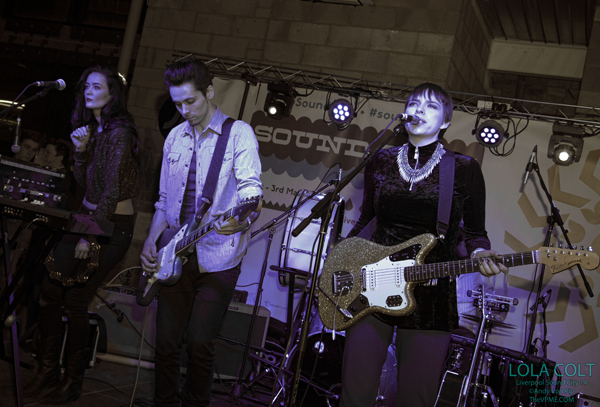 Liverpool Sound City returned for its seventh year, turning disused garages, dilapidated warehouses, and gothic revival Cathedrals into vibrant bustling venues for three days of musical madness. 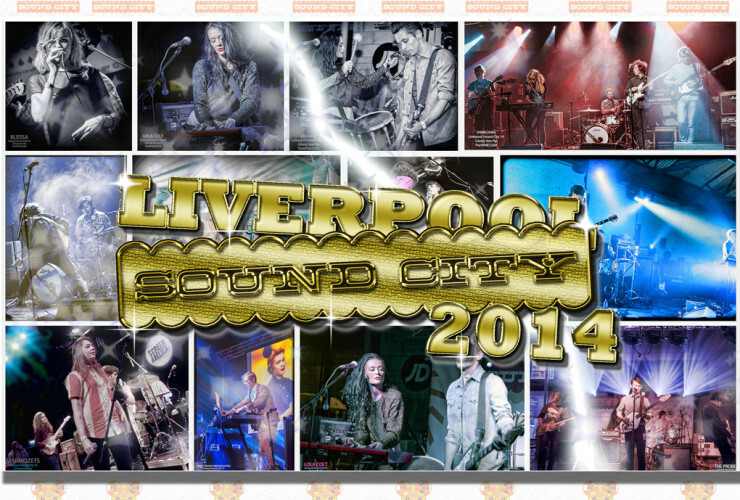 If the queues where anything to go by on the final night of this year’s Sound City when roads had to be closed due to the sheer volume of people entering the main festival hub then it’s fair to say Sound City 2014 was the biggest and best yet. 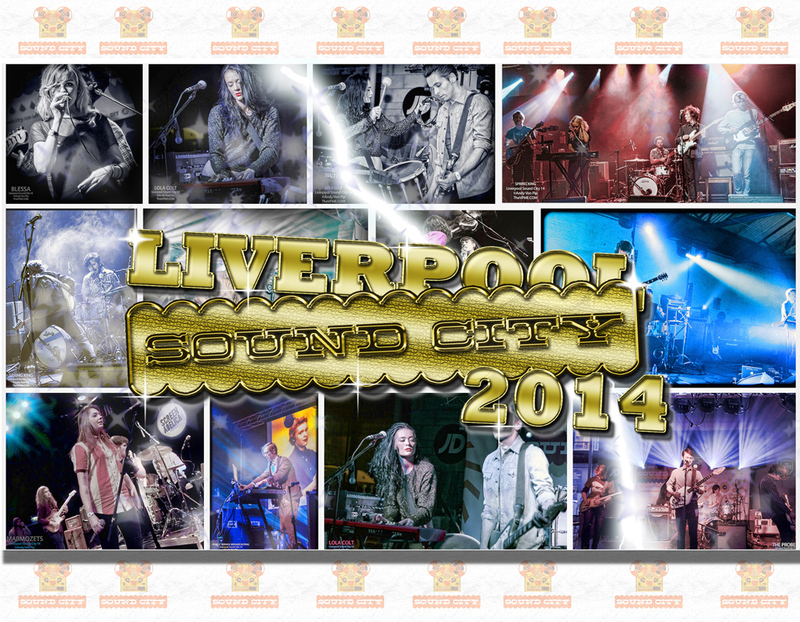 You’ll find a photo gallery below, followed by our thoughts on this years festival. We began our Sound City by taking in a few of the music industry conferences which were taking place during the day at the Hilton Hotel. One of the problems with the music industry, apart from the word ‘industry’ has been it’s shocking failure to adapt to the seismic changes the digital age has brought. It has left many at the big music labels cast as demented spittle-flecked King Canutes raging against the dying of the light and the huge crashing waves of change that have all but consumed their business model. And the theme of many of the conferences discussed the issue of music in the digital age. What became apparent was that actually nobody has a clue about how any new sustainable model could be implemented to support new artists, that the jigsaw had been thrown into the air and the pieces have yet to land. As Alan McGee stated, if anybody tells you they can see the big picture yet, they’re lying. There were also keynote speeches from Thurston Moore and John Cale who both separately explored similar themes namely about the power of anger and subversion in music. As interesting and inspiring as both these icons of music are the elephant in the room was the uncomfortable irony that such topics were being covered in a building owned by one of the largest hotel brands in the world… in an air-conditioned business conference room. Then again, it can’t be easy being a successful subversive iconoclast after making a career in the very industry that you once set out to subvert. But onto the music, over the three days, we witnessed some fabulous performances in some incredible venues and whilst this isn’t an exhaustive list, as we hope to eat at some point today here are our own particular highlights. Lola Colt are a band we’d been hoping to catch live for some time and they took our high expectations to a whole new level. 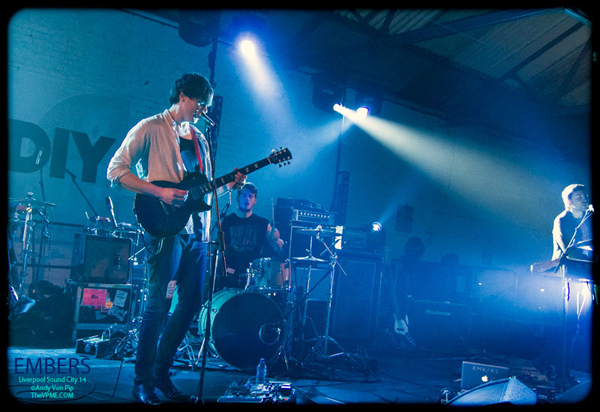 Playing in an old redeveloped factory space the bands moody stirring psyche infused cinematic anthems filled the venue with a dark sinister menace. 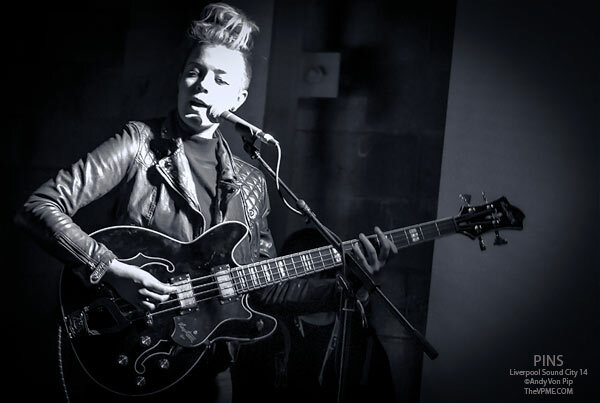 The sheer intensity of singer Gun’s performance was compelling and unsettling in equal measure whilst the rest of the band conjured up a magnificent sonic assault with each members input adding layers and nuances to their surging explosive live sound. Amazing! Alas we only caught ten minutes of The Wytches set but their surf doom grunge explosion seems to be the perfect antidote to the empty ‘on trend sound’ of macbooks belching insipid beats over fey vocals. 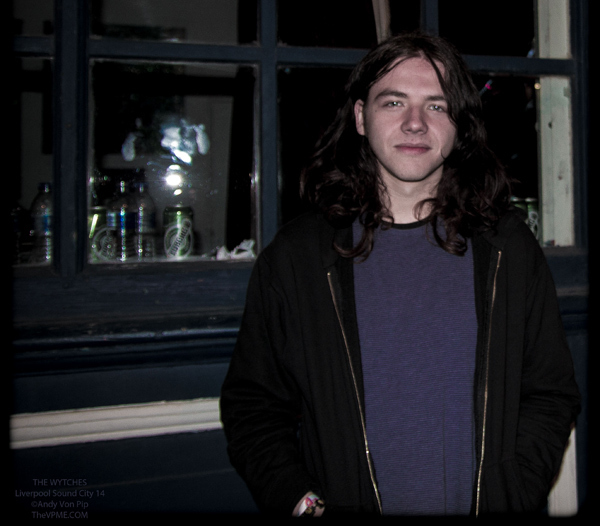 The Wytches are a ferocious incendiary Molotov cocktail of demented twisted sound that looks set to explode in broadsheet approved pop music’s smug smirking face. As day, two kicks off we are alas suffering from a hangover of Shane MacGowan proportions. Thankfully, the sheer energy of Spring King’s effervescent speed garage pop punk is just what the doctor ordered. 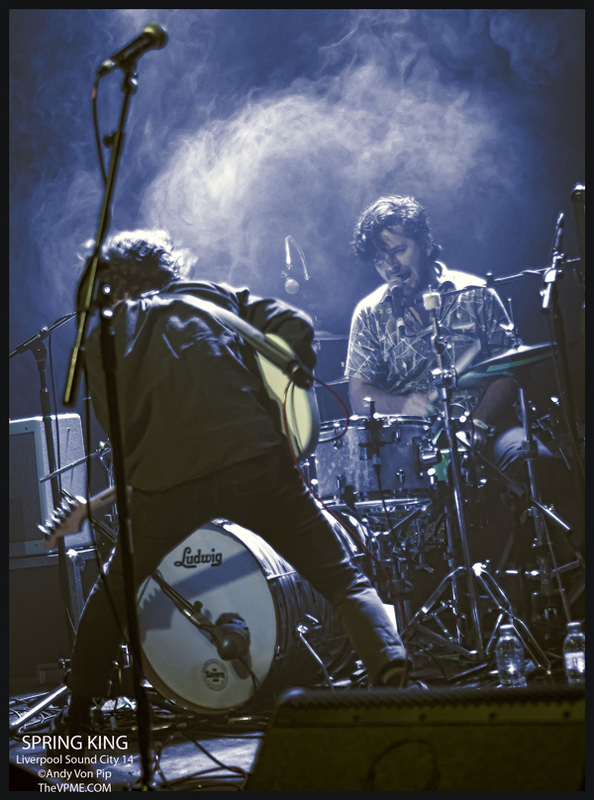 Originally the bedroom project of multi instrumentalist and producer Tarek Musa Spring King has since expanded into a fully-fledged band, which features Tarek as drummer and front man. Whilst singing he attacked his drum kit with such venom we can only assume he had a picture of George Osborne’s unctuous smirking fizzog overlaid on his skins. The band leapt about the stage with such energy that it was impossible not to feel reinvigorated and ready to take in more music. One of the strangest set’s of day two, New York’s Gambles (Matthew Daniel Siskin,) dispensed with the self indulgent fripperies musicians often use y’know things such as a stage, a band and a microphone, seemingly dismissing them as the tinsel of the pauper and the baubles of the fool. 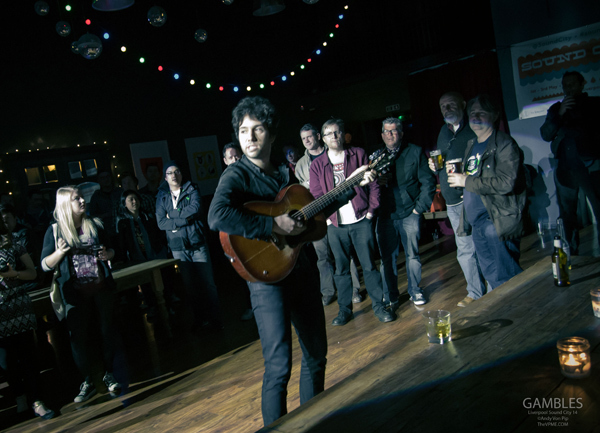 Instead he preferred to play an unplugged session wandering round the audience or occasionally leaping onto tables. The assembled crowd where certainly enraptured by his unconventional approach, drawn to his magnetic personality, clever wordplay, and self-deprecating humour. 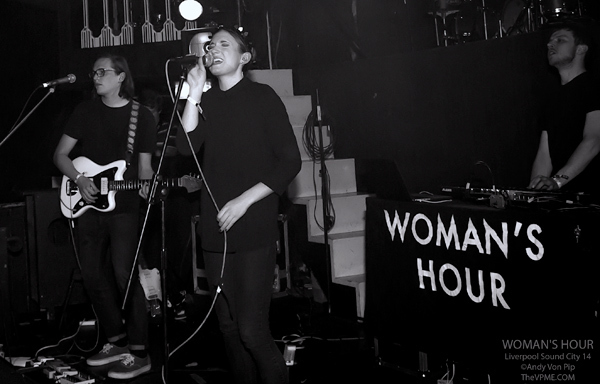 Like last year’s set by No Ceremony, Woman’s Hour seemed to suffer from playing at a time when perhaps their brand of shimmering understated minimalism would have been better suited to later in the evening. There’s no doubting the quality of the bands output to date, ‘Her Ghost‘ and ‘Our Love Has No Rhythm’ for example are sublimely beautiful, and their cover of ‘Dancing In The Dark’ was almost worth the admission fee alone. 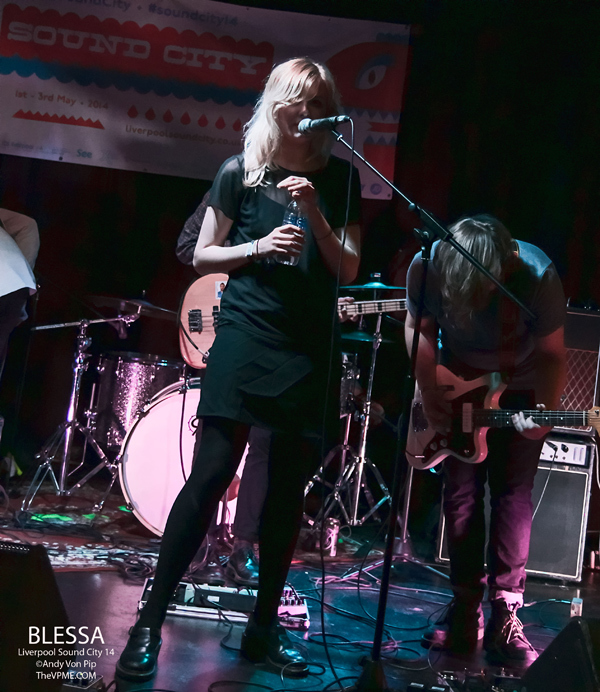 One of the Sound City music industry conferences debated “the rise of the influencer” which primarily discussed the role of music blogs in the digital age. 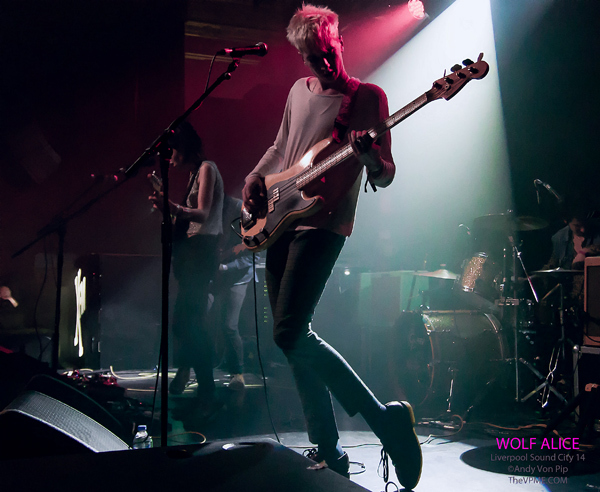 And as chance would have it Wolf Alice were the most blogged about UK artist during 2013 according to Hype Machine. 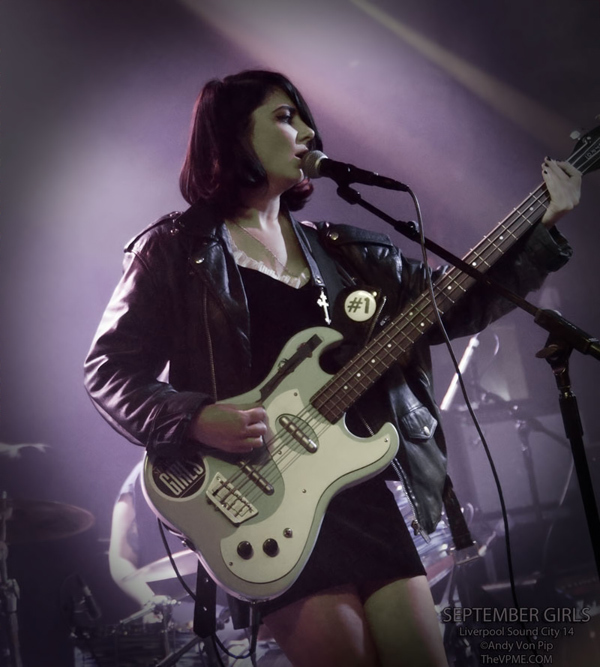 Whether this directly correlates to the queues seen stretching around The East Village Art Club for Wolf Alice’s gig is open to debate, but it seemed Sound City organisers might have underestimated the bands appeal. Perhaps a bigger venue would have been more appropriate because it really was an impressive turn out for an unsigned band and and in a city as unpredictable as Liverpool. Wolf Alice seemed genuinely taken aback and touched by the size of the crowd and their appreciative enthusiasm for each song. After producing a faultless set there was a palpable feeling that you’d just witnessed something very special indeed and that the band are on the cusp of something immense! 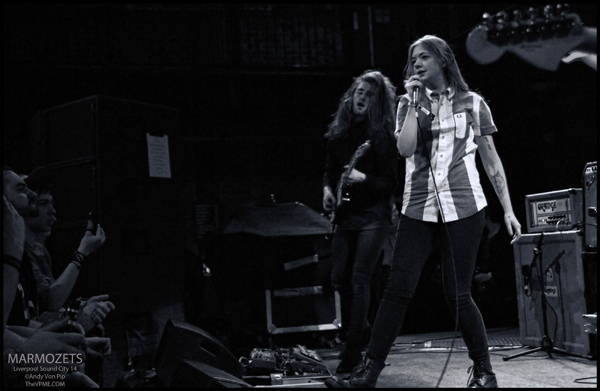 Despite reservations that the venue, Liverpool’s Mello Mello bar might not quite be the right setting for Blessa’s blissed out dreampop the Sheffield four piece produce a set rammed with stellar tunes. 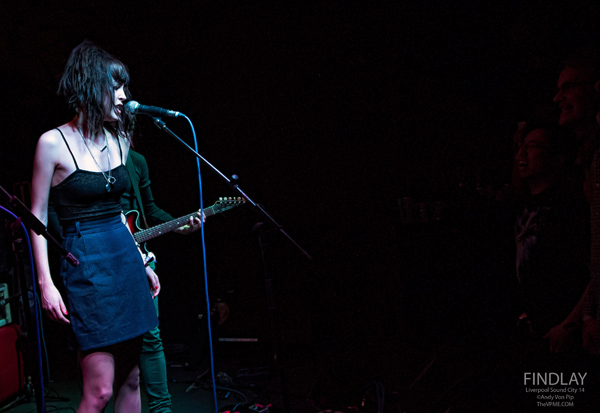 Liv Nellar’s gorgeous vocals floated above a perfect shoegazy guitar shimmer to devastating effect and as our top tip for 2014 – we could ask no more of them. 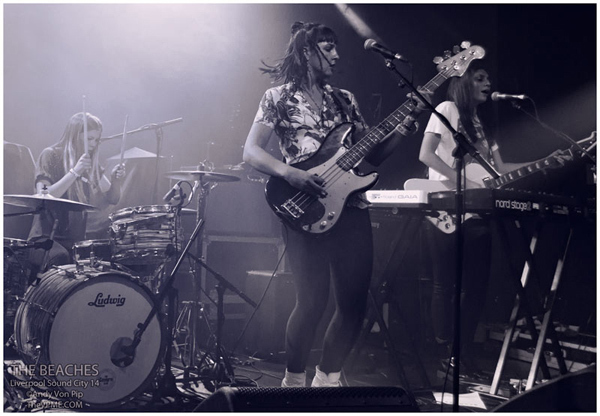 Obviously we cannot wait to hear their new EP ‘Love Is An Evol Word‘ which is released through their own label Carmel Records on 23rd June in conjunction with Generator. The Probes proved to be one of the unexpected highlights of the whole festival. 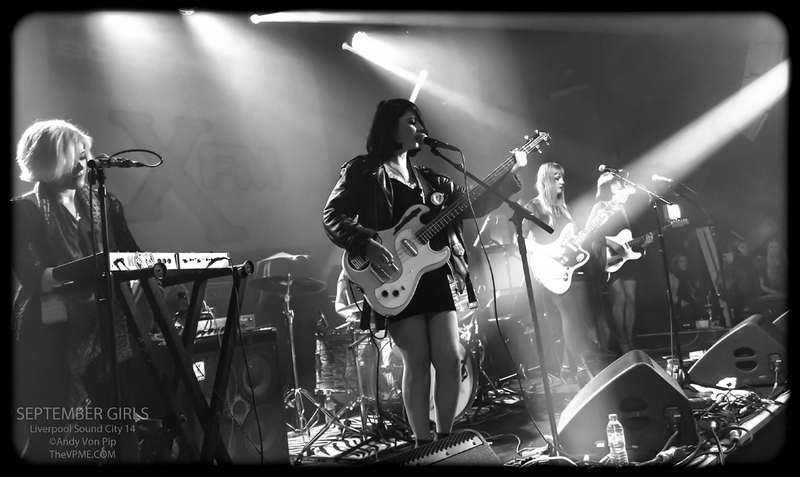 When we say unexpected, we knew they were good, very good after being sent their fantastic ‘Synesthesia’ EP. But little did we know just how good these lads actually are until we caught them live. 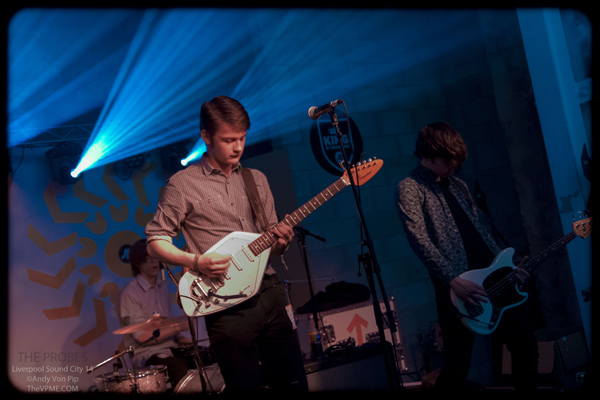 From dark post punk new wave juggernaughts to amazing psyche spangled jams these chaps seem to have it all. 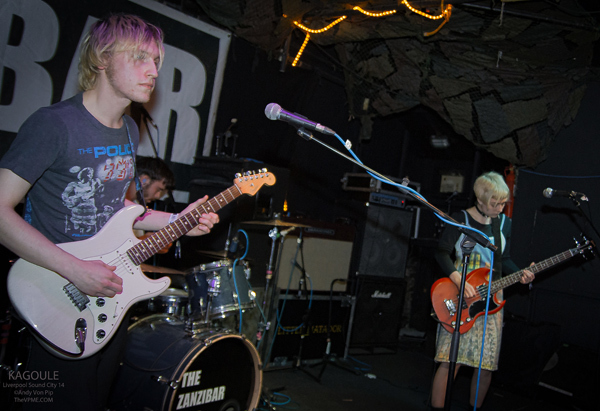 Definitely one of THE most exciting bands to emerge from Liverpool in the last few years with the potential to be huge. And so our final gig of a monster three-day session ended with us being stuck in a huge queue just to get into the vicinity of the venue, thankfully many were off to see bafflingly popular Kooks who continue to have delusions of adequacy. Happily for us this left the way clear after a brief case of gridlock to finally catch Public Service Broadcasting after missing two previous gigs. The brain child of the corduroy loving J Wilgoose Esq. and aided by his faithful side kick Wigglesworth II PSB take samples from old archive footage, propaganda newsreels and public information films and blend them with soaring electronic post-rock grooves. This works fantastically well in a live setting – it’s an all round multi-media experience which is imbued with humour, darkness whilst the visual elements of the show add extra layers of complexity and emotion to proceedings. 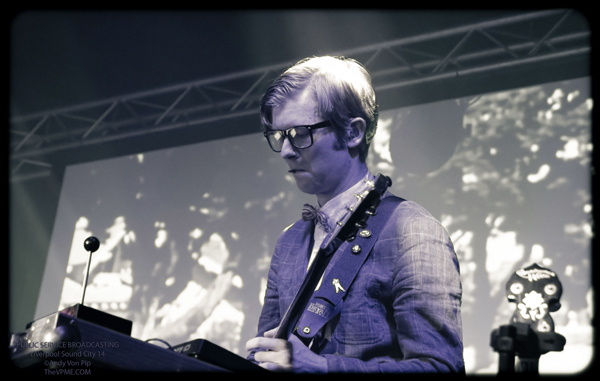 If you imagine Pâthé News, the Royal Institute Christmas lectures combined with elements of Radiohead, Massive Attack, and even Pink Floyd this would give some indication of what to expect from Public Service Broadcasting as a live entity. Perhaps appropriately after the fantastic highs of this year’s Liverpool Sound City, the final song is PSB’s musical pinnacle as ‘Everest’ brings down the curtain on the best Sound City yet!